Elie Ness Lighthouse near Elie and Earlsferry below dark clouds illuminated by warm evening light. 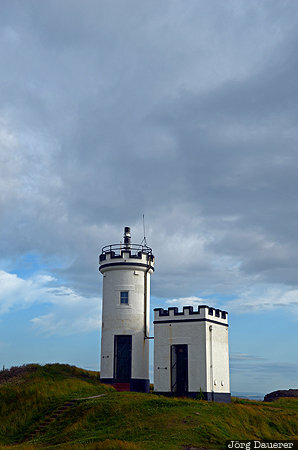 Elie and Earlsferry is in Fife in the south east of Scotland in the north of the United Kingdom. This photo was taken in the evening of a sunny day in July of 2013. This photo was taken with a digital camera.